...my copy of the Creek/Smith Fw 190 Vol 3 1944-45 has arrived. I must admit to have been a little apprehensive about the contents given that Crandall and Japo must have covered just about everything there is to know about the Dora. I shouldn't have worried - while there is a JG 6 Dora on the cover this is not a Dora volume specifically at all while the late A and F sub-types get the lions share of the coverage.
" ..any advantage that this aircraft may have in performance over other models of the Fw 190 is more than offset by its poor handling characteristics..."
Hmm. Chapter 22 moves the Fw 190 story to D-Day, Arnhem and the arrival of the first Doras at III./ JG 54 while chapter 23 covers the Sturmgruppen in the defence of the Reich. Chapter 24 moves us back to the Eastern Front and features an excellent sequence of full page pictures of JG 54 Antons undergoing maintenance with a five-page profile of Otto Kittel including rare images of Kittel at Riga in June 1944, although not unfortunately of his Fw 190 - a lovely sequence of these do exist in at least one collection I am familiar with..Chapter 25 by Nick Beale covers various SGs, NSGrs and other 'special' Fw 190 units including KG 200. Chapter 26 takes us from September 1944 to 01 January 1945 and includes a four-page profile of Walther Dahl but repeats the various JG 300 ramming 'myths' - Bretschneider's ramming of 7 October 1944 -" he was later found safe hanging from his parachute on the edge of a ravine.." - and Dahl's own account of his ramming of a B-17 for which the authors of the JG 300 history found no evidence. While admitting that Dahl's memoir was 'colourful' the authors disappointingly fail to take the opportunity to set the record straight on Dahl's combat record - Lorant in his history of JG 300 singularly failed to find evidence of even 100 combat victories for Dahl far less the 128 victories ascribed to him just about everywhere, a figure drawn from the same 'colourful' bio. 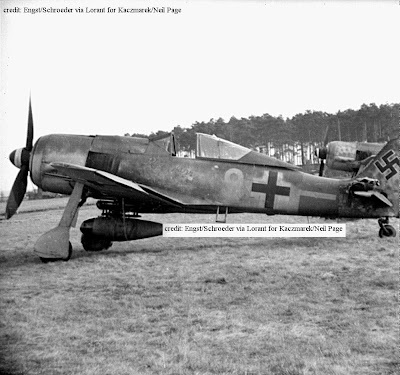 Chapter 27 covers in-depth over 35 pages the 'special' weapons (Sonderwaffen) which were produced to arm various marks of the Anton including the Hagelkorn glider bomb and the Ruhrstahl X-4 missile and the SB 800 Kurt 'bouncing' bomb. Chapter 28 covers the end in the West and there is a superb chapter on foreign use and proposed 'jet' variants and various 'what-iffery'. 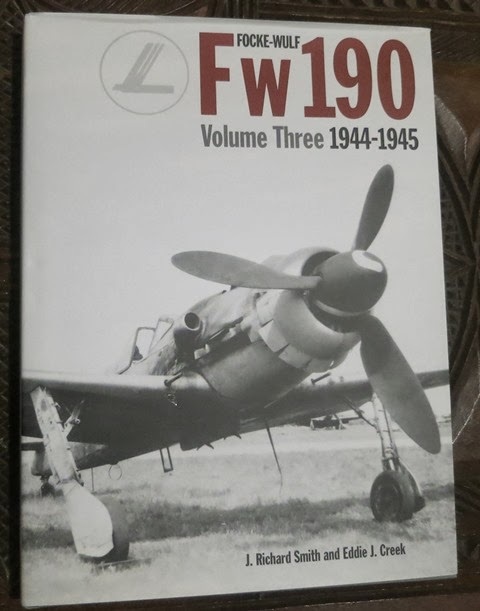 In summary then this latest addition to Smith & Creek's Fw 190 trilogy continues the operational and developmental history of the type and extends the page count to over 1,000 for the three volumes - the results of over forty years study according to the authors preface! Hard then to argue that this will not become the definitive work in English. There is of course the occasional howler too as is probably unavoidable with such a high page-count - an entire page (p.817) is given over to Hannes Theiss' 6./ JG 300 'yellow 9' 'roter Hahn' ('Red rooster') - the inscription is quite visible in the pic- along with artwork ..but both are captioned as belonging to 7. Staffel JG 1! To sum up, photo content and reproduction, layout, text and artworks are all excellent here - the bonus was the fair number of photos that were new to me, especially from the Eastern Front Schlachtgruppen. It goes without saying that all enthusiasts should be looking forward to a possible volume 4 featuring the scale drawings absent thus far in this treatment. And more artworks - if I have one criticism of Volume 3 it is the relative paucity of colour side views (only about five or six Doras for example) - Swiatlon's work is some of the best. Incidentally I am aware of the 'problem' under the dust jacket, the author himself dropped me a note to tell me about it. I don't honestly feel it will detract from the pleasure of owning this very nice book. At the time of writing this volume is currently the 'best-selling' military aircraft book on amazon - and now the pre-orders have shipped (£34) they've even dropped the price to £27 !! (indicated RRP is £55 ). While I personally don't believe that this sort of aggressive pricing is good for the publishing industry (definitely not the retail side of it anyway..) how can you pass up such a bargain..
Photographed at Loebnitz bei Bitterfeld, the Fw 190 A-8 assigned to Feldwebel Hannes Theiss of 6./ JG 300 displayed the inscription 'roter Hahn' under the cockpit. 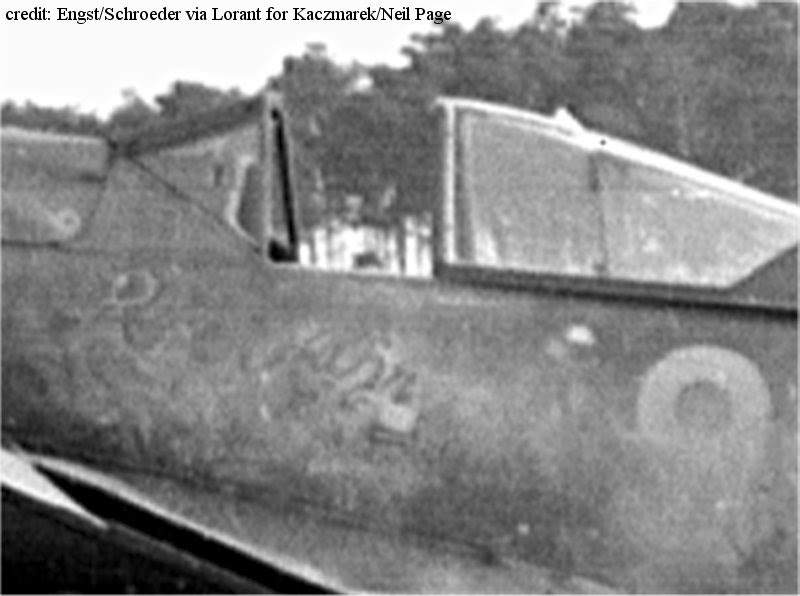 The close up reveals that there is no cockerel insignia on the fuselage side as previously illustrated at jg300.de. Theiss claimed three B-17s, two B-24s, four P-51s and two P-47s at the controls of this aircraft. 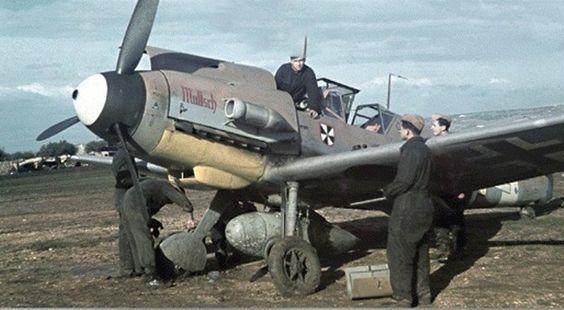 This Fw 190 survived through to May 1945 before being blown up at Holzkirchen ..